ViFind is the ultimate El Capitan Menu Bar solution for Windows and it’s not just eye candy either! 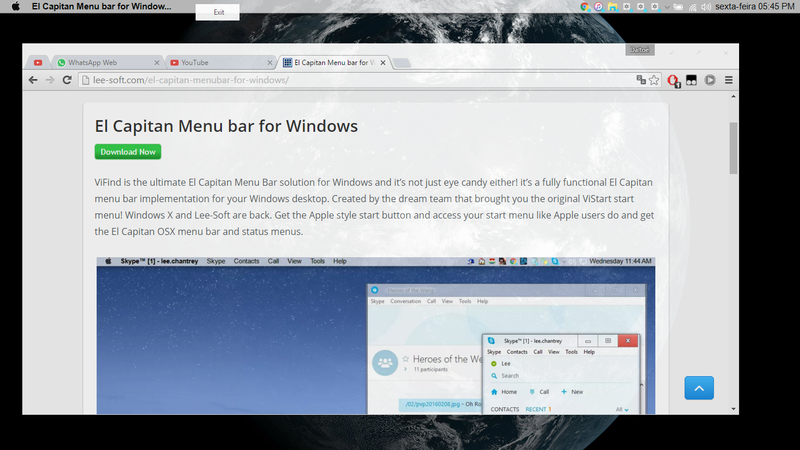 it’s a fully functional El Capitan menu bar implementation for your Windows desktop. Created by the dream team that brought you the original ViStart start menu! Windows X and Lee-Soft are back. Get the Apple style start button and access your start menu like Apple users do and get the El Capitan OSX menu bar and status menus. The El Capitan style start button provides Mac like access to the Windows start menu. Integrating features from Windows and El Capitan forming the perfect hybrid with a genuine finderbar user experience. This is only the first build and it’s highly experimental. So there could be more features to come in the future! Could you tell me which part doesn’t work? From the screenshot it appears functional. You taught us how to video??? Do you mean you want me to post a video on how to use it? Do you mean the original taskbar sometimes becomes visible when using ViFind? 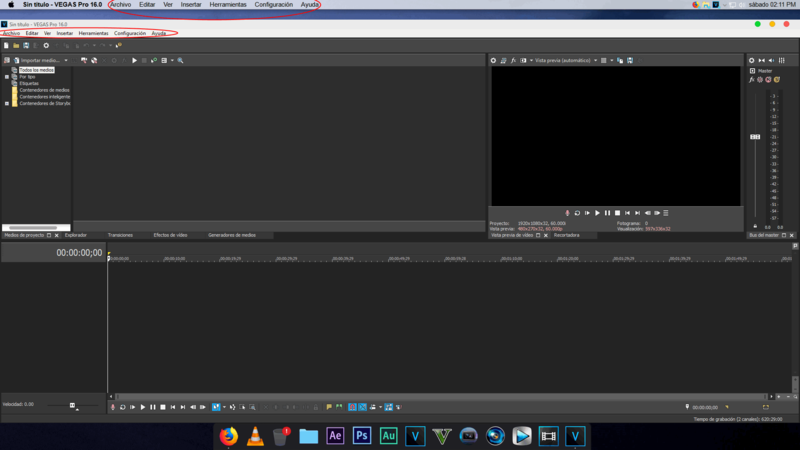 I have split screen with taskbar and windows application, running windows 7 64bit ultimate.. How to fix it..
What do you mean by the “drill down” cursor? Great! Is great work! Thank you a lot for this application. In future version maybe you can improve start menu like osx (not necessary a clone) like obsolete Objectbar. Please make a forum to see request of users, improvements, etc… Lots of desktop moders waiting for news and some requests. Which antivirus are you using? You may need to submit a false positive report when it flags the file as a virus. Hey, I noticed the FinderBar UI wasn’t that accurate, I don’t want to complain, just wanted to point out the design was different, Is there any way you could make a version of this where the icons are layed out like the actual El Capitan menu bar anytime soon? (look at an el capitan screenshot) Other than that, great software! works well with windows 10 and a El Capitan UX style. 2. Right one has the taskbar on the bottom , same results as 1, still a bit off of the bottom screen. 3. I think ViFind should always (or optionally) bring start menu close to it. 4. Double clicking system tray icons doesn’t work, only single left click and single right click works. When I click full screen about 2 centimeters is reserved at the top of the screen under the task-bar. Also some of the pinned applications don’t appear, Autodesk applications for example. not working in windows 7 32 bit. the system tray icon does not appear, the percentage of battery and wifi icon. please fix.. I have ALWAYS loved your work. You are fantastic. I just have one problem with this finderbar. It doesn’t show “File, Edit,View,Go,Window or Help”. It also has no drop down menus. Is it supposed to have those things or am I missing something ? I’m using Windows 7 Ultimate 64bit. Is there any way to customize my own this bar? Sometimes the orginal Windows taskbar is coming to front and vifind is behind the taskbar. In this case i cant use any of the bars. I have to exit vifind and restart explorer.exe. Is there a fix or how can i avoid this? For me ViFind works fine, and its show all, except for File, Edit, and other likely Notepad commands. Big congratulations! Is it possible to scale the bar and the elements on it up ? Also is there any configuration windows for this =? So, when a program is not active, can you add finder and go and window and help and other stuff? works on this one are done? Thanks for your support. It should depend on which window has active focus, if you open Notepad it will be able to read the file menus from that application and copy it. @marcy, do you mean how do you make it start up automatically with Windows? @Gabriel It hasn’t been implemented yet, it’s not a bug though. that’s a good try, but still far away from perfect… no customization (hate the apple icon btw, for me I need the finderbar functionality but I’m not going to hide the beautiful win10 identity), also lacks the most impressive feature in finderbar ( its linkage to the opened window so it display the main commands above). some weird behavior also noticed (app icons don’t open apps, and a weird applicationframehost.exe icon appear and all apps can be opened from it). Hello. I would like to asky why does it show every process instead of the open applications? It really glitches everything. Hello, great work, but I can’t hide or unpin the explorer folder nor the app next to it, both seems buggy (it doesnt open, I don’t know what app is that lol). Also, the menu from Skype or any other software doesn’t show in the taskbar. I have Windows 10 fall creators 1709 update. I already tried to reinstall, unpin all folders from the original windows taskbar, clean the pc, etc. Not that I would like to delete this application at the moment but just in case I do how would Ido it on windows 10?? Like what would the file in the uninstall section be? First of all this looks amazing and authentic. I have some questions about some of the functionalities that may not be working. The start menu works fine however the programs that are in the tray do not respond when clicking on them and the calendar, wifi, and sound settings do not respond as well. I don’t know if I ran into a bug but these are some of the most used things that I use. It’s a pain to have to go into the Windows 10 settings to function with these. Are these things supposed to function or are they just for looks? Hi it works great, but is there multiple monitor support. How can I access settings? This is really awsome, however there’s one thing I would like to see: If an app is not supported by ViFind it would be nice if it would show “standard” options like on MacOs (File, Edit, View…). This would be awsome!